A continuous mechanical extract system is similar to having individual extraction fans in bathroom, kitchen and cloakroom etc except that each area is connected by ducting to a single central extractor fan located remotely and the air expelled from one outlet. Continuous mechanical extract ventilation is designed to work at a low background level of extraction with an occasional boost when required. Having the central extraction fan operating remotely from the ventilated areas has the benefit that fan noise is removed from these areas; it is effectively silent. Continuous ventilation also means that the ventilation is working when required; there's no need for an occupant to remember to switch it on when required and off when finished with. It may also help, in hot weather, to cool a house by expelling hot air and drawing in cooler air from outside. 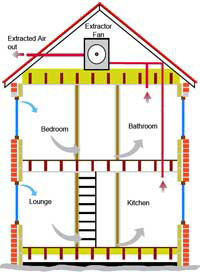 The need for background trickle vents to allow fresh air into the building depends upon the air tightness of the building; this is not usually known at the time of design so it is usual to include adjustable trickle vents in double glazed units in all rooms except those connected to the Continuous Mechanical Extract Ventilation to allow fresh air to enter the building to replace the stale air removed through the ducts. It is really only practical to install Continuous Mechanical Extract Ventilation in a new build or during a major refurbishment. 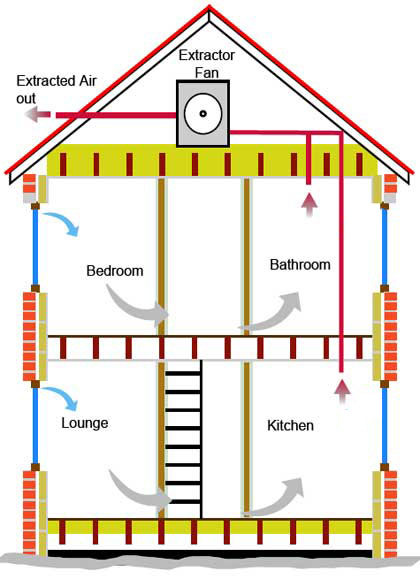 Apart from the ducting from each area, the system includes the remote central extraction fan unit which can usually be installed on the roof space, if available, but it is small enough to be fitted in a cupboard in the eaves if the house has rooms in the roof. The controls are very simple, generally consisting of just a speed control for the extraction fan - the background level of extraction can be boosted when required. Using a single, central extractor fan unit can be a more cost effective in large houses than having individual extractor fans (with their individual wiring, switches, holes through walls, grills etc) in each area requiring ventilation.